Until recently, radar sensor development was one of the automotive industry’s last remaining electronics fields without realistic lab and production testing. That is about to change, as Lutz Fischer, Product Manager Complementary Products, and Udo Reil, Product Manager Customer Solutions, Rohde & Schwarz explain. Simulating reproducible scenarios with multiple moving and static targets at greatly varying distances in the confines of a building has simply not been feasible in the past. However, the ARTS9510 automotive radar target simulator from Rohde & Schwarz makes these tests possible. Radar sensors are key components in advanced driver assistance systems (ADAS) and have made possible an entirely new class of in vehicle comfort and safety functions within just a few years. ADAS applications such as brake and lane change assistants and adaptive cruise control take an active role in vehicle guidance and therefore play a major role in safety. The reliability requirements for these systems are correspondingly strict, and thorough field testing is required before they are launched on the market. Lab testing, however, should be conducted prior to field testing in order to anticipate all critical situations using realistic test scenarios. There is an economic reason behind this approach - test drives are costly and time consuming, while lab tests are relatively cost efficient, can be quickly executed and can be repeated and varied under defined conditions (field-to-lab testing, FTL), always desirable in T&M applications. The ARTS9510 radar target simulator now opens up these advantages for testing in vehicle systems equipped with radar sensors. The ARTS9510 family was developed specifically for the automotive industry, i.e. for radars operating in the 24GHz and 77GHz frequency bands. Their flexible, future ready architecture enables these instruments to do more than just handle FMCW signals. They can deal with the entire spectrum of radar technologies. Versatility is a key advantage in every respect. The instrument platform can be custom configured to match the specific use case and the radar characteristics to be covered. Variations of the simulator include both design (desktop instrument with integrated computer and graphical user interface or remotely controlled system instrument) and module configuration (frequency ranges, bandwidths, optional extensions) options. The ARTS meets all current and future requirements for simulated distances, variable target sizes (radar cross section, RCS), resolutions and object speeds. It delivers the same precision for near-range radars such as those used for parking assistants as it does for long range systems, for which it can simulate an object at up to 2.4km travelling at radial velocities of up to 700km/h. Optionally it can even display the angle of arrival of moving objects. The ARTS is suitable for the lab and the production line. The horn antenna (optionally, bistatic operation is possible with two antennas for greater dynamic range) can be placed on the rear, side or bottom panel of the instrument, making it possible to configure convenient desktop test set-ups as well as horizontal and vertical assemblies in test chambers. Installing a microwave transceiver for either horizontal or vertical signal polarisation creates an additional degree of freedom. And if these options are not enough, the highly compact (approximately the size of a matchbox) transceiver module can be detached from the simulator for remote operation. This dramatically expands its range of applications, for example, in EMC chambers. The trend toward autonomous vehicles will continue to generate increasingly more and demanding test cases, to cover the complexity of real life situations in the most comprehensive way possible. It is no longer enough to generate and analyse signal traffic via wired bus systems (CAN, FlexRay, LIN, etc.). On the contrary, realistic system simulation requires all control loops to be closed via the RF connections involved (GPS, radar, C2C, eCall, etc.). Hardware-in-the-loop (HIL) systems for these simulations must also be outfitted with various air (wireless) interfaces, and the ARTS offers such a real time capable interface. 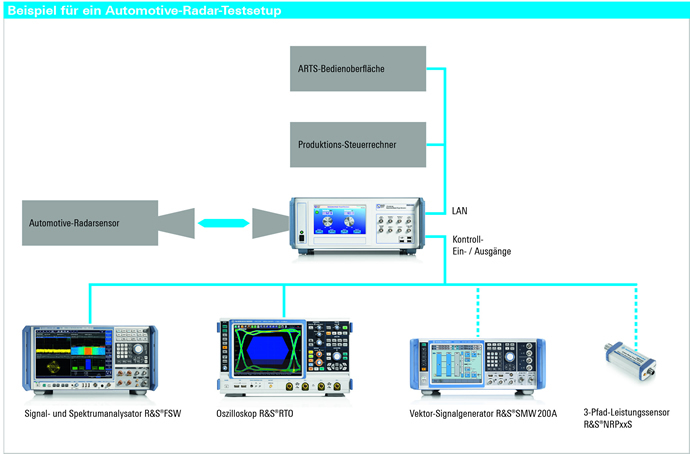 All other interfaces are available from the Rohde & Schwarz T&M instrument portfolio. The radar target simulator itself is a compact, modular and flexible toolbox enabling test engineers to use the included DLLAPI libraries to develop their own signal and control routines and generate, for example, non-linear velocity profiles. As an additional feature, test engineers may use the simulator’s large memory depth to program long time (20 to 30 ­minutes, depending on the number of target parameters and their rate of change), multi-target scenarios and assign individual dynamic ranges to each target. An IF control output allows users to analyse the received signal with external test instruments. The chart (page 14) shows possible extensions for examining radar signals more thoroughly. The combination with the R&S FSW signal and spectrum analyser provides an especially comprehensive image. While the ARTS is used primarily to assess the functionality of radar sensors and to close signal paths in HIL scenarios, the R&S FSW enables exact, automatic measurements of the signals themselves. This makes it possible to quickly identify possible trouble spots and optimisation potential in sensors. The ARTS9510 represents another important developmental step in the effort to use sophisticated T&M equipment to control functionalities and comply with safety standards for increasingly complex automotive systems. Automobile manufacturers, Tier 1 suppliers as well as sensor and chipset manufacturers can now use this instrument to create reproducible, reliable test conditions in every phase of the development and production process, while drastically reducing test drive costs and development times. The ARTS9510 can be upgraded to a fully configured radar technology test environment by adding other RF T&M equipment from the Rohde & Schwarz portfolio.